Following his rescue of his uncle and the Argonian children in StarTropics, Mike Jones accidentally solves the cipher found on the side of the Argonian space pod, causing him to be sucked into the pages of the Oxford Wonder World, travelling through time. Mike must travel through nine chapters, taking place in different locations throughout history as he searches for the mysterious Tetrads, but they are also being sought by his old nemesis Zoda. 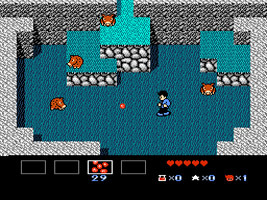 Explore each area, earn weapon upgrades and head into the action scenes to battle monsters and navigate dangerous platforms in your search for the Tetrads. In each time zone Mike travels to in the Oxford Wonderworld, he collects a Tetrad, seven shapes made up of four blocks. They are based on the blocks in Tetris, and Chief Coralcola assembles them at the end of the game after claiming that his middle name is Tetris. In the Wii Virtual Console release of the game, the Tetrads have simply been renamed "Blocks", presumably to avoid licensing issues with the Tetris Company. 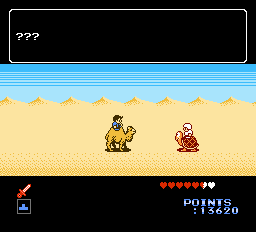 In Chapter 3, when you find the pizza delivery guy in the middle of the desert, he is riding a turtle slowly. The turtle strongly resembles the Koopa Troopas from the Mario series.